West Virginia, setting a precedent for cooperation among federal agencies, state governments, municipalities, and industries. Soon after, wastewater treatment standards were enacted for the Cincinnati pool. Bacterial quality objectives for the Ohio River were established in 1951, and an assessment of potential health hazards from trace constituents in wastewater was initiated. By 1954, municipal wastewater treatment standards for the Ohio River had been established. In relation to the industrial dischargers, a resolution adopted in 1959 placed responsibility on industries for reporting spills and accidental discharges to state agencies. Following the 1965 Federal Water Quality Act, ORSANCO adopted stream water quality recommendations. In 1970, ORSANCO Pollution Control Standard 1-70 revised the pollution control standards established in 1954, making secondary treatment the minimum requirement for wastewater treatment plants and establishing equivalent treatment requirements for industry. From 1957 to 1965, $82,786,500 in federal aid was allocated to 638 projects in the Ohio Valley. The communities matched every federal dollar with $2.50 of local funds for a total of $282,966,000 spent on improving conditions. The majority of treatment works, both in place and under construction during this time, were equipped for secondary treatment. For 3 years before federal aid was offered, Pennsylvania provided incentives for smaller communities to upgrade their treatment by offering funds to communities upon compliance with standards. 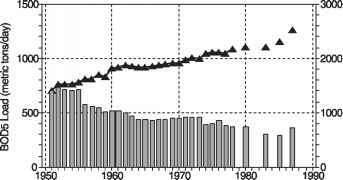 Although the population served by municipal facilities has increased greatly under these programs (Figure 11-6), increasingly high water quality criteria and limited funds have caused a sharp increase in population served by facilities classified as inadequate between 1965 and 1990. 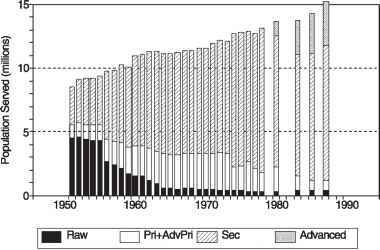 Figure 11-6 Long-term trends in population served by municipal wastewater treatment plants in the ORSANCO District. Sources: ORSANCO, 1978, 1988. 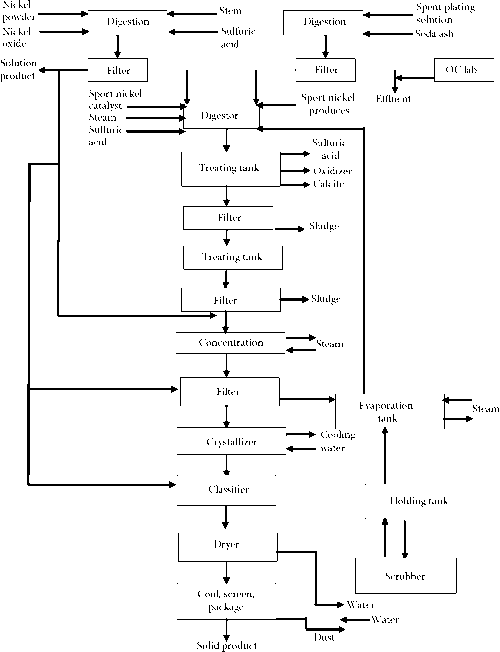 Figure 11-7 Long-term trends of wastewater flow, influent and effluent BOD5 for the ORSANCO District. Data based on population served with 165 gallons per person per day, influent BOD5 of 215 mg/L, and removal efficiencies of 36 percent (primary), 85 percent (secondary), and 95 percent (tertiary). Sources: ORSANCO, 1978, 1987.